I must be somehow fascinated by people who have become ill. I’ve read quite a few books dealing with sickness in some fashion. I’ve even read another graphic novel about a case of cancer, Mom’s Cancer. But Stitches is more than just being about David Small’s childhood disease. In fact, I would argue that his cancer is one of many events he uses to highlight a seriously dysfunctional family and its impact on him. This makes Stitches compelling in a way that a straight story about his health never could have been. Small’s drawings make up no small part of setting the mood and tone of the book, which is why I love that he chose to draw his memoir. The people are almost uniformly drawn tight, with knit brows, frowns, and generally hostile body language. No one is portrayed as friendly toward Small until we meet his psychologist toward the end, and he’s drawn as a rabbit — I believe he was the March Hare, mainly because Small had a fascination with Alice in Wonderland as a child. Small also has an incredible sense of when pictures can convey more than words ever could. The horror of the research floor of the hospital, for example, is much more effective because Small shows us the jars of fetuses, then his face, in alternate cells. It makes way more of an impact than writing something on how he saw the jars and imagined that one got out and started chasing him. Now, down to the actual memoir. Small’s family is dysfunctional in the extreme. His father is mostly absent, home only occasionally from his job as a radiologist at a Detroit hospital. When he is home, he alternates between lecturing his son and giving him x-rays to look at his sinuses, which most likely caused his subsequent cancer. His maternal grandmother is a nutcase, treating Small in a horrible fashion when they visit her in southern Indiana. But it is his mother who is truly the worst person in Small’s life. She is cold, almost always angry. She blames Small when he develops the lump on his neck that requires surgery, telling him “doctors cost money and money is something that is in short supply in this house!” After an original misdiagnosis of the lump as a cebaceous cyst, they wait three and a half years before allowing a surgeon operate on his neck. During the gap, his parents bought a new car and new furniture. After the removal of his lump, along with one of his vocal cords, his mother didn’t tell him the lump was cancer. She showed no sympathy for her son, who suffered from recurring nightmares and would frequently turn on all the lights in the house. Her concern was with the electric bill. Her miserable and, at times, tyrannical, behavior could possibly be explained by her sexual orientation and the influence of her mother. She may have felt trapped in her marriage by society and her children. It is almost inconceivable, though, that someone would have the capacity to so hate their own child, a being dependent upon her to do what is best for him. Being frustrated with how her life turned out cannot excuse her callousness for a boy who was sick and needed her help. The only good thing they appear to have done for him is put him in therapy. His therapist was able to clarify many things for him, and I believe that therapist made it possible for Small to have a relatively normal post-childhood life. Really, the therapist showed him how a caring relationship should work, and quite probably saved Small from following in his mother’s and grandmother’s footsteps. This book is phenomenal in its exploration of what it’s like growing up in a hostile environment. As someone who has two caring and supportive parents, Small provided me with insight into how one’s environment can shape you. One can end up like his mother — twisted, bitter, and cruel — or you can end up like him, a survivor who came through his ordeals, both regarding his health and his home, and became a successful man who becomes the maverick of his family by being normal. Stitches is a superior memoir that packs a lot of emotional punch. Disease is a scary thing. It can disturb an entire life’s worth of planning in a frighteningly short amount of time. It has the power to separate people from those they love most. It can make the most mundane of actions impossible to perform. Bruce Feiler, finding himself seriously ill, made the decision to not allow his cancer to sever all ties with his daughters. He documents his steps to make this happen, and it’s a good thing he did. If nothing else, I can confidently say Bruce Feiler has good people in his life, most likely because he himself is a good person. He is lucky enough to have six men he feels would be able to stand in for him and provide guidance for his daughters. These are also men who come to provide for him — they visit while he’s sick, they talk to him frankly about how they would help his daughters in their times of need. This book is a tribute to male friendships, and I found it very interesting to read for that aspect alone. But this is also a story about how the past shapes the present. Feiler’s own father and grandfathers have interesting stories that reflect how they ended up parenting. His friends’ childhoods altered how those men think of parenting, friendship, and life. Even Feiler’s disease can’t escape connections with history– his cancer-affected leg is the same one that he shattered as a child when he was hit by a car. His story is touching, but I had a couple of issues with the structure of the book. There are two narratives winding themselves through this book: the standard parts that focus on telling the reader about one of the dads, or about Feiler’s back-story, or about meeting his wife. The other is made up of letters: one he wrote to the dads, one he wrote to his daughters, and several he wrote during the course of his illness to friends and family. The two don’t feel smoothly-joined to me. There are points where the reader hears about certain aspects a couple of different times, which I don’t particularly like. I would rather not have the everyday events semi-sequestered in the newsletters, seeing as the rest of the book also contains a good amount of the everyday. I also can’t help but think that Feiler could do with a little more candor. It was a bit exhausting reading about all the positivity in his life, with very little shown of the more realistic moods of anyone, the children included. We hear about his crying and the occasionally-off behavior of the twins, but most of it feels glossed over in order to portray everyone involved in the best light possible. Having been seriously ill myself, some of the coping narrative doesn’t resonate with my own experiences. It could be that we’re just different people, but I think that he is purposely holding back on the bad times for some reason. Whether that is to avoid appearing weak, or to protect his children, or for some other reason, I don’t know. I like his message. I really like the non-letter parts of the book. I’m glad that he is doing well, and that he decided to share his story. I’m hoping he’ll write something else about his daughters, something in which they are all healthy and don’t have to worry about getting the marrow out of the moment. I suspect they’re pretty good at doing that without trying. No matter how many medical memoirs I read, I never seem to get enough. The best ones, I’ve found, lead me to a new understanding of how we, as biological creatures and thinking beings both, function. They bring me into a realization about myself and others that would not have otherwise occurred to me. I think this is a gift that this particular genre can give more easily than most other forms of nonfiction. 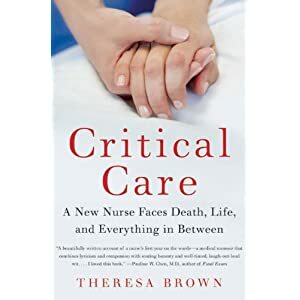 Theresa Brown’s entry into the field, Critical Care, is a competent work written about the in-hospital training of the author as a nurse. In her book, Brown discusses some of the standard concerns of a new nurse: feeling inadequately trained for some of the situations that arise; facing the strict chain of command that structures every hospital; dealing with horrible time constraints and unreasonable work loads; and learning to balance personal life. Brown writes on these topics with an open hand, allowing the reader to easily grasp what is being said. She has a gift for making the reader understand what, exactly, is going on with a particular treatment or procedure, and is able to make most situations fairly approachable. I suspect this is because she has a background as an English professor, and has the technical skill to use language in a very effective way. In fact, I think her idiosyncratic career history makes her story more compelling — it’s quite the career change to go from being in front of a classroom to being in a hospital room, hanging an IV. She takes a look at some interesting topics, such as injuring her knee after becoming a nurse and viewing the role of patient from within, rather than without. In fact, the book is full of fascinating stories about patients, the learning process, and on keeping one’s humanity while working with those who are ill. It takes a while to realize that even those people Brown discusses as having gone into remission are more likely than not either dead or experiencing relapses. How hard that must be for their caregivers, both past and present, to handle. The stories she tells about her experiences and the people she has known and taken care of are not, however, ultimately satisfying. The main reason for this is that she doesn’t manage to provide a feeling of depth to the lessons she attempts to impart. Her anecdotes and recalled stories all have an underlying message of some sort or another, but are lacking the aspect of new insight. The things she tries to teach feel as if they have been discussed before and been discussed better; she has nothing to add to the conversation that is special or innovative. This is sad, because I think, with a little more encouragement, Critical Care could go from being a mediocre nurse’s memoir to being a work of incredible power. Brown works with oncology patients, and, from what she has written here, she has had many powerful experiences. She just needs to be able to focus on creating tight narratives that can stand on their own, without the explanation of what should be gleaned from the story she feels compelled to include.